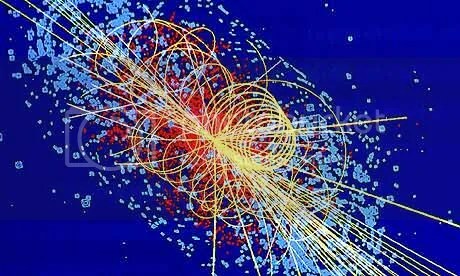 Currently Two research teams are performing experiments at CERN, the European Organization for Nuclear Research near Geneva, to try and prove the existence of The Higgs boson (sometimes nicknamed the “God particle” and are hoping that the particle, if it exists, can help explain many mysteries of the universe. In order to conduct their experiments, They are using the $10 billion (£6.4 bn) Large Hadron Collider , situated under the Swiss-French border, a 17-mile (27-kilometer) tunnel where high energy beams of protons are sent crashing into each other at incredible speeds. The Higgs Boson is a hypothetical massive elementary particle that is predicted to exist by the Standard Model (SM) of particle physics. The Higgs boson is an integral part of the theoretical Higgs mechanism. If shown to exist, it would help explain why other particles can have mass. It is the only predicted elementary particle that has not yet been observed in particle physics experiments, and is named after a British physicist named Peter Higgs who among others theorized the particle’s existence more than 40 years ago in order to explain why atoms, and everything else in the universe, have weight. Theory has it that as the universe cooled after the Big Bang, an invisible force known as the Higgs field formed.This field permeates the cosmos and is made up of countless numbers of tiny particles – or Higgs bosons, and as other particles pass through it, they pick up mass. Theories that do not need the Higgs boson also exist and would be considered if the existence of the Higgs Boson was ruled out. They are described as Higgsless models. Although the signal doesn’t meet strict scientific standards for a ‘full scientific discovery’, it’s still enough for researchers at CERN’S Large Hadron Collider (LHC) to predict a discovery next year. This latest data has generated much buzz among scientists and although it would be an enormous scientific breakthrough for the physics world if the Higgs boson was found, officials at CERN have ruled out making any such announcement this year. The late, great Lindley Armstrong “Spike” Jones was born on this day (December 14) in 1911. He is best remembered as a musician and bandleader, who specialised in performing satirical arrangements of popular songs. Ballads and classical works, which after receiving “the Jones treatment” would be punctuated with gunshots, whistles, cowbells, and outlandish vocals and usually sounded absolutely hilarious. Jones’ got his nickname from being so thin that he was compared to a railroad spike. At the age of 11 he got his first set of drums. As a teenager he played in bands that he formed himself. A railroad restaurant chef taught him how to use pots and pans, forks, knives and spoons as musical instruments. He frequently played in theater pit orchestras. In the 1930s he joined the Victor Young orchestra and thereby got many offers to appear on radio shows, including Al Jolson’s Lifebuoy Program, Burns and Allen, and Bing Crosby’s Kraft Music Hall. From 1937 to 1942, he was the percussionist for the John Scott Trotter Orchestra, which played on Bing Crosby’s first recording of White Christmas. Spike Jones was part of a backing band for songwriter Cindy Walker during her early recording career with Decca Records and Standard Transcriptions. Her song “We’re Gonna Stomp Them City Slickers Down” provided the inspiration for the name of Jones’ future band, the City Slickers. The City Slickers evolved out of the Feather Merchants, a band led by vocalist-clarinetist Del Porter, who took a back seat to Jones during the embryonic years of the group. They made experimental records for the Cinematone Corporation and performed publicly in Los Angeles, gaining a small following. The original members included vocalist-violinist Carl Grayson, banjoist Perry Botkin, trombonist King Jackson and pianist Stan Wrightsman. Through the 1940s and early 1950s, the band enjoyed huge success and recorded under the title Spike Jones and his City Slickers and toured the United States and Canada under the title The Musical Depreciation Revue. Among the series of satirical recordings in the 1940s were humorous takes on the classics such as the adaptation of Liszt’s Liebesträume, played at a breakneck pace on unusual instruments. Others followed: Rossini’s William Tell Overture was rendered on kitchen implements using a horse race as a backdrop, with one of the “horses” in the “race” likely to have inspired the nickname of the lone SNJ aircraft flown by the US Navy’s Blue Angels aerobatic team’s shows in the late 1940s, “Beetle Bomb”. In live shows Spike would acknowledge the applause with complete solemnity, saying “Thank you, music lovers.” A collection of these 12 “homicides” was released by RCA (on its prestigious Red Seal label) in 1971 as Spike Jones Is Murdering the Classics. They include such tours de force as Pal-Yat-Chee (Pagliacci), Ponchielli’s Dance of the Hours, Tchaikovsky’s None but the Lonely Heart, and Bizet’s Carmen, besides the two above. Then In December 1945 Spike released his version of Tchaikovsky’s Nutcracker Suite, arranged by Joe “Country” Washburne with lyrics by Foster Carling. Sadly The rise of rock-‘n’-roll during the 1950’sand the decline of big bands hurt Spike Jones’ repertoire. The new rock songs were already novelties, and Jones could not decimate them the way he had lampooned “Cocktails for Two” or “Laura.” He played rock-‘n’-roll for laughs when he presented “for the first time on television, the bottom half of Elvis Presley!” This was the cue for a pair of pants — inhabited by dwarf actor Billy Barty — to scamper across the stage. Jones was always prepared to adapt to changing tastes. In 1950, when America was nostalgically looking back at the 1920s, Jones recorded an album of Charleston arrangements. In 1953 he responded to the growing market for children’s records, with tunes aimed directly at kids (like “Socko, the Smallest Snowball”). In 1956 Jones supervised an album of Christmas songs, many of which were performed seriously. In 1957, noting the television success of Lawrence Welk and his dance band, he revamped his own act for television. Gone was the old City Slickers mayhem, replaced by a more straightforward big-band sound, with tongue-in-cheek comic moments. The new band was known as Spike Jones and the Band that Plays for Fun. He also recorded a cover of “Dominique” with Spike Jones’ New Band in 1964, a hit by The Singing Nun, in which he not only plays part of the melody on a banjo but melds the melody successfully with “When the Saints Go Marching In!” The last City Slickers record was the LP Dinner Music For People Who Aren’t Very Hungry. The whole field of comedy records changed from musical satires to spoken-word comedy (Tom Lehrer, Bob Newhart, Mort Sahl, Stan Freberg). Spike Jones adapted to this, too; most of his later albums are spoken-word comedy, including the horror-genre sendup Spike Jones in Stereo (1959) and Omnibust (1960). Jones remained topical to the last: his final group, Spike Jones’ New Band, recorded four LPs of brassy renditions of pop-folk tunes of the 1960s (including “Washington Square” and “The Ballad of Jed Clampett”). Lately I have been listening to the remastered version of Exile on Main St. By the Rolling Stones. It was the tenth British and 12th American studio album and was originally Released as a double LP in May 1972. The album draws on many genres including rock and roll, blues, soul, R&B, gospel and country. The original release of Exile on Main St. met with mixed reviews, but is now generally regarded as the band’s best album. In 2003, the album was ranked 7th on Rolling Stone magazine’s list of the 500 greatest albums of all time, the highest ranking Rolling Stones album on the list. The remastered version of the album was released in Europe on 17 May 2010 and in the United States on 18 May 2010, which was exactly the time when I was in hospital so I was unable to get it until now. It also features 10 new tracks, including “Plundered My Soul”, “Dancing in the Light”, “Following the River” and “Pass the Wine” as well as alternative versions of “Soul Survivor” and “Loving Cup”. 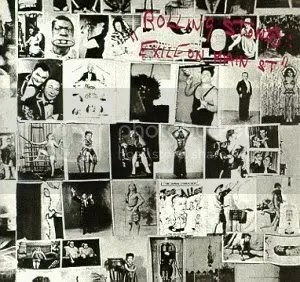 The cover of Exile on Main Street is a photograph by Robert Frank of a collage.